This post has been sponsored by Randalls. All thoughts and opinions are my own. 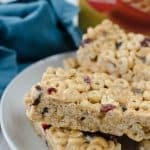 No Bake Cheerios Bars – easy no bake bars with Honey Nut Cheerios, peanuts, and dried cranberries coated in peanut butter and marshmallow! Great for lunchboxes! Can we talk about the stress of being in charge of team snacks? I only sign up for weeks waaaay into the season so I have time to see what everyone else brings. I mean, I definitely don’t want to be the mom that shows up with something lame and gets made fun of by a bunch of 12 year old boys for the rest of the season. 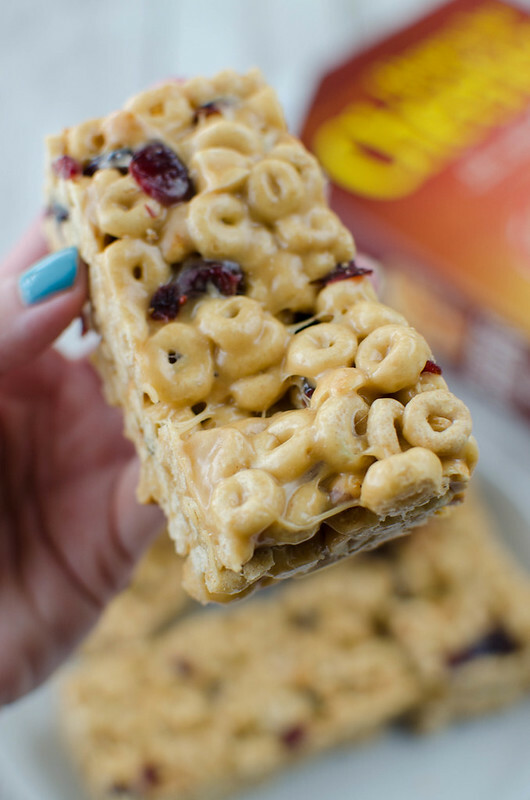 My plan right now is to bring a couple batches of these no bake bars made with Honey Nut Cheerios because they’re too delicious for the kids to be mad at! I picked up the Honey Nut Cheerios and some of my family’s other favorite products at my local Randall’s recently. 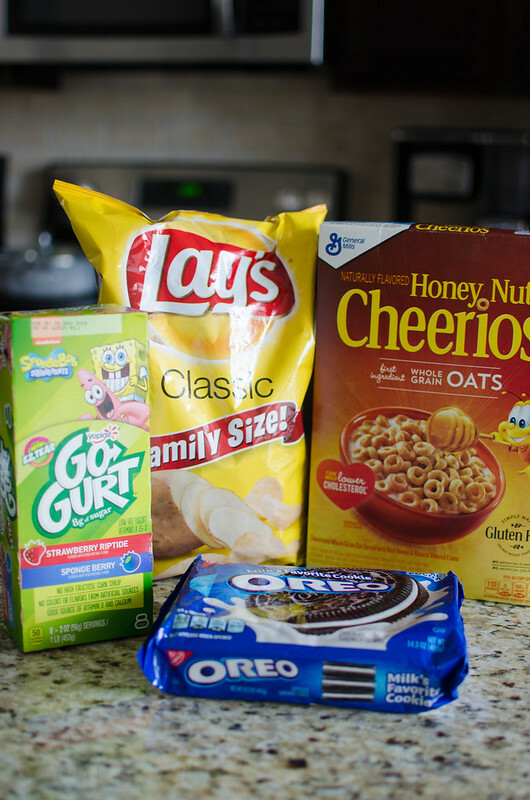 Honey Nut Cheerios, Yoplait GoGurt, Oreo Cookies, and Lay’s Classic potato chips will all be part of the Stock Up Sale at Randall’s. The products mentioned in this post are on sale at the Albertsons Companies family of stores from 10/3 to 10/9, and new products will be on sale from 10/10 to 10/16. Products on sale at United retailers may differ. The Stock Up Sale (Add link) is the perfect time to stock up on items you know your family uses often or even things you use for entertaining this time of year! 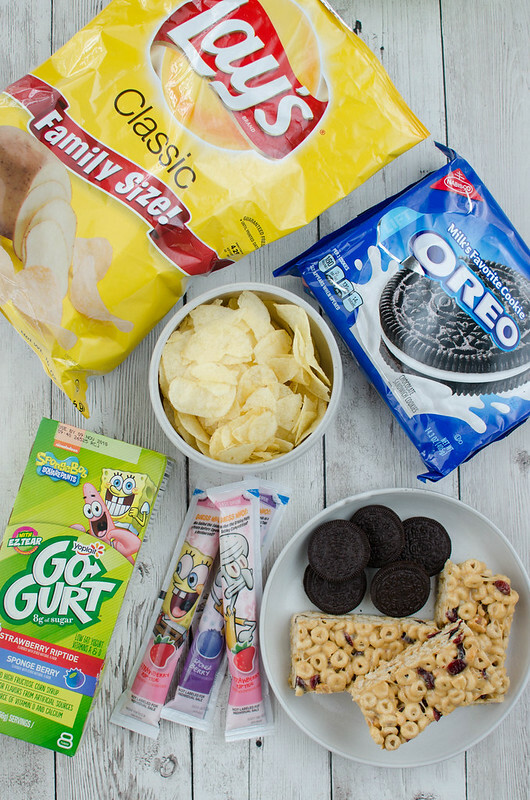 A bowl full of Lay’s Classic with some Oreo Cookies on the side is kind of a perfect idea for all a casual football get together. And if you’ve ever been to my house, you know we keep GoGurt in the freezer at all times because it’s hot in Texas and frozen yogurt feels like a treat after being outside all day. I’ve been shopping at Randall’s since we moved to central Texas in 2015. You just can’t beat their sale prices, especially at a Stock Up Sale like this one! Plus, I love how the store are laid out, how they’re always decorated seasonally (they had a giant beautiful display of pumpkins and squash and fall flowers out front when I was there last! ), and the bakery is incredible. And if you’re a craft beer person, they definitely have the best selection of any grocery store in the area. 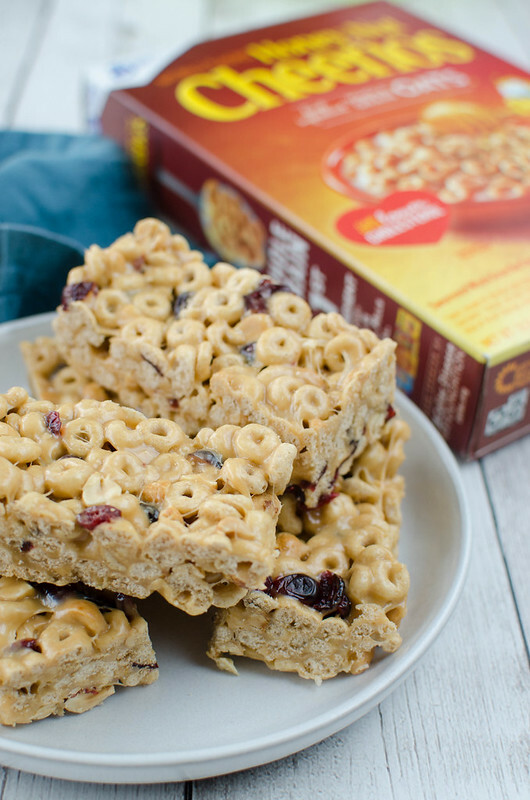 These No Bake Cheerios Bars couldn’t be any easier! 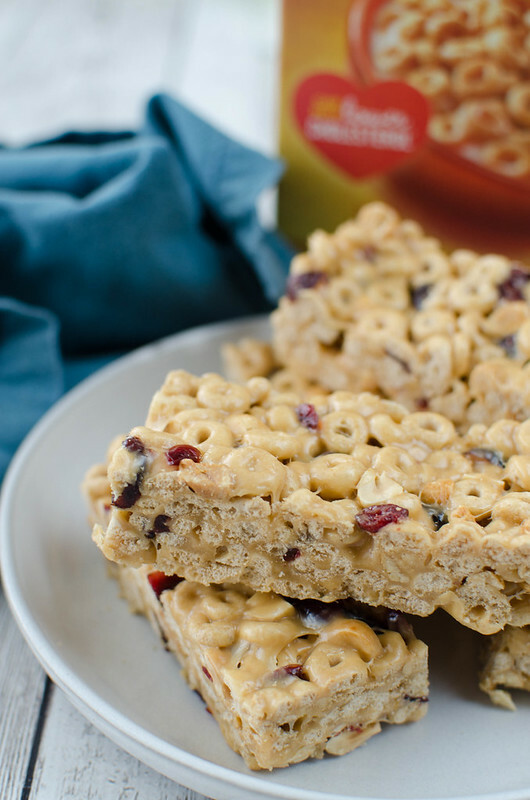 You just need the Honey Nut Cheerios, dry roasted peanuts, and dried cranberries. Coat all that in a peanut butter marshmallow mixture and spread it into a baking dish. From there, you just have to wait for it to set up, which is definitely the hardest part. I sliced them into granola bar-type pieces but you could do smaller squares if your children don’t eat as much as mine. I ended up wrapping them in plastic wrap so we could take them on the go and they were the perfect pre-practice energy boost for my kiddos. Let me know in the comments what you bring when you’re in charge of sports snacks! And tell me I’m not the only one that stresses out about it way more than I should. I purchased these products and more at my local Randalls, but you can also stock up and save at any of the Albertsons Companies family of stores including Albertsons, Safeway, ACME Markets, Jewel-Osco, Vons, Pavilions, Tom Thumb, Shaw’s, Star Market, and Carrs/Safeway. 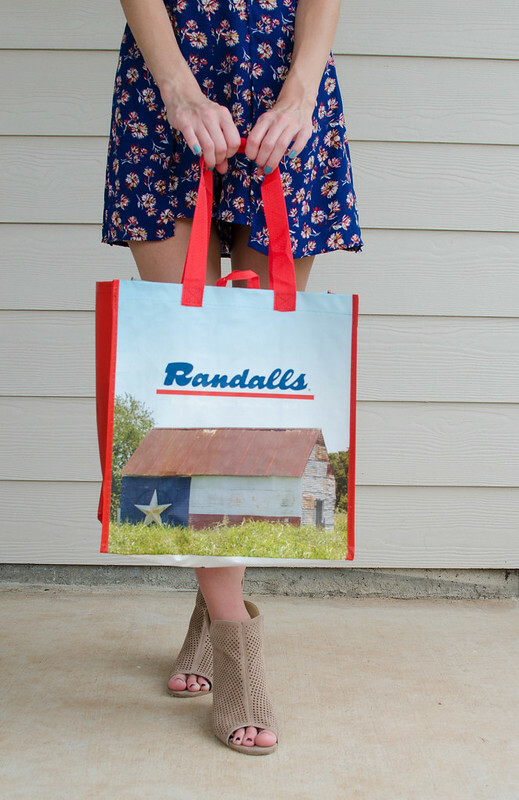 Visit the Randalls website to find a store near you and discover some fun meal prep tips and recipe ideas! 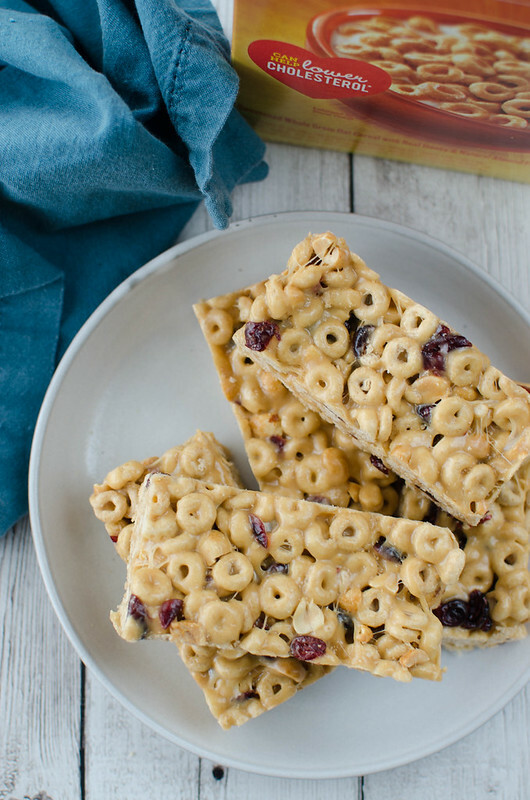 In a large mixing bowl, stir together Honey Nut Cheerios, peanuts, and cranberries. Set aside. In a saucepan, melt butter and marshmallows over low heat, stirring until smooth. Stir in peanut butter. Pour the marshmallow mixture over the Honey Nut Cheerios mixture and gently stir to make sure everything is coated. Transfer to a 8x8-inch dish and spread the mixture to the corners. Let set before cutting and serving.